Home Health & Wellness Become Involved With YOU! 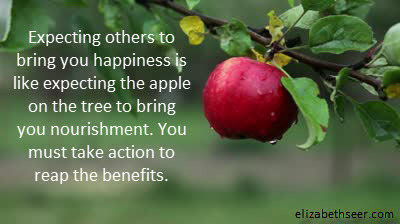 Expecting others to bring you happiness is like expecting the apple on the tree to bring you nourishment. They are both good for you, but you must take action to reap the benefits. Only your action, picking the apple and eating it, will allow you to gain it’s health-giving properties. Only your engagement in your happiness will bring it into your life. Others can lay happiness at your feet, just as others can pick the apple for you, but it’s up to you alone, becoming involved, to make the happiness (and the apple) sustain you. become involved for you, happiness and apples, happiness requires action, take action for you. Bookmark.